I suppose it must have seemed like a good idea at the time, at least from a certain perspective. Global warming, one story goes, is a dire threat to humanity's survival – to the survival of the very planet, even – and global warming is driven by increasing concentrations of carbon dioxide in the atmosphere caused by the burning of fossil fuels like coal, oil, and natural gas. A second story has it that global oil reserves have peaked and we will soon be running out of our precious black gold. According to yet a third story, while there may be plenty of oil, much of it is inconveniently located beneath land ruled by autocratic, antagonistic regimes. Whether to stave off global warming, replace dwindling oil supplies, or achieve energy independence, all three of these stories argue for the development of alternative sources of energy. In addition to old standbys like solar, wind, hydro, and nuclear power, another player has lately taken up a prominent position on the stage: biofuels, which are produced from recently dead biological matter (basically, plants), as opposed to fossil fuels, which come from long dead biological matter. According to a recent Time magazine cover story, "The Clean Energy Scam" by Michael Grunwald, biofuels such as ethanol have become "the trendy way for politicians and corporations to show they're serious about finding alternative sources of energy and in the process slowing global warming." As the title of Grunwald's article suggests, however, all is not as it seems. 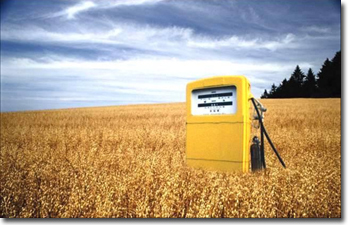 Biofuels, it turns out, are bad for people, bad for prosperity, and bad for the planet. We are, by all accounts, in the midst of a global food crisis. "A wave of food-price inflation is moving through the world, leaving riots and shaken governments in its wake," says a piece in the April 19 edition of The Economist. In the last 12 months, the price of corn has risen 50%, wheat 75%, and rice nearly 200% (see "The New Face of Hunger"). The president of the World Bank figures that 100 million people are in danger of being forced into poverty by the soaring cost of food. UN Secretary General Ban Ki-moon met with key development agencies in Switzerland at the end of April to discuss what to do about the problem. The current crisis is not one of supply – there have been no massive, widespread harvest failures – but rather of demand. One might well imagine that as millions become richer in places like China and India, they are exerting upward pressure on food prices by eating more. In fact, though this is happening, it is happening only gradually. The high price of oil is also having an overall inflationary effect, as is the U.S. Federal Reserve's loosening of the money supply in reaction to the subprime lending fiasco. But the real culprit behind the recent rapid upswing in food prices, according to The Economist, is "the sudden, voracious appetites of western biofuels programmes, which convert cereals into fuel." Diverting crops like corn to ethanol refineries increases the demand for corn, which raises the price of corn. This in turn causes some farmers to shift fields to corn production, and some consumers to substitute away from corn, both of which raise the prices of other staples. Jean Ziegler, an independent food expert at the UN, told the recent Swiss conference that "biofuels, as they are produced at present, constitute 'a crime against a large part of humanity.'" He was not alone in singling out biofuels. Also at the conference, Céline Charvériat, Oxfam International's deputy advocacy director, said that biofuels are "a major cause of increasing prices" and called on rich countries to end their biofuels mandates. But if consumers in rich countries want biofuels, then that's what they want, and markets will just have to adjust, right? Except that it's not consumers who are choosing to use biofuels in a free market – it's governments that are pushing biofuels on consumers with market-distorting mandates and subsidies. According to an article by Robert Bryce published in Slate in 2005, subsidizing ethanol "has cost American taxpayers billions of dollars during the last three decades, with little to show for it. It also shovels yet more federal cash on the single most subsidized crop in America, corn. Between 1995 and 2003, federal corn subsidies totaled $37.3 billion." Things have only gone from bad to worse since then, as mandates and subsidies for ethanol have been ratcheted up dramatically. Take away those subsidies, and even with the current high price of oil, nobody but the most fervent environmentalist is buying ethanol. Subsidies by their very nature take money from taxpayers and spend it on things the taxpayers would not have spent it on – either that, or they do nothing at all and are completely pointless. If ethanol is a way to address global warming, replace dwindling oil supplies, or achieve energy independence, then people either value these goals highly enough to pay the difference at the pump or they don't. Forcing those who don't to act against their values through tax-funded subsidies is like burning money. "If ethanol is a way to address global warming, replace dwindling oil supplies, or achieve energy independence, then people either value these goals highly enough to pay the difference at the pump or they don't." But even if we were to accept that global warming is a big problem and that government should intervene, it is hard to imagine a worse way of intervening than subsidies to producers. How is the government to choose which alternative energy technologies to encourage? In practice, powerful lobbies determine where the money goes. If intervene we must – and it is far from clear that we must – far better to tax the negative externality or establish a cap-and-trade system and let entrepreneurs compete to find the best solution. Centralizing these decisions in government does not work, because governments do not know the best solution. In fact, no one starts off knowing the best solution to any problem, and competition is the only way of finding it out. One thing is clear: of all the possible alternative energy technologies governments could have chosen to encourage, biofuels were probably the worst. In addition to raising food prices, to the detriment of the poorest denizens of the planet, and frittering away billions of dollars of tax money, it is becoming increasingly evident that pushing biofuels does nothing to address the alleged problems of global warming, peak oil, or energy dependence. Even back in 2005, according to Bryce's Slate article, critics were charging that "making ethanol from corn requires 29 percent more fossil energy than the ethanol fuel itself actually contains." Bryce concludes, "What frustrates critics is that there are sensible ways to reduce our motor-fuel use and bolster renewable energy – they just don't help the corn lobby." Instead of wasting billions of dollars on ethanol, Bryce argues, we could spend it on fuel-efficient cars and solar cells, which would at least give us something for our hard-earned cash. But it gets worse. According to Grunwald's Time magazine cover story, biofuels are contributing to the deforestation of the Amazon rainforest. The chain of unintended consequences is as follows: 1) subsidies for biofuels lead some U.S. soybean farmers to switch to corn; 2) fewer soybeans lead to higher soybean prices; 3) higher soybean prices lead Brazilian soybean farmers to expand, displacing cattle ranchers; and 4) cattle ranchers clear new pastures out of the Amazon. Of course, since plant matter stores carbon, cutting down more of the Amazon releases yet more carbon into the atmosphere, making ethanol an even more self-defeating solution to global warming than it already was. In short, the environmentalist movement has done it again. In a misguided effort to "save the planet" by lobbying for the full force of government to be brought to bear on this alleged problem, they have contributed to an increase in human suffering, just like they did with their successful efforts to ban DDT. This time around, in an effort to stave off global warming and the end of oil (and with an assist from energy independence enthusiasts and the corn lobby), they have driven up the cost of food, leading many to go hungry; they have sucked more money from the public trough, leading to slower economic growth; and they have caused more, not less, carbon dioxide to be released into the atmosphere, in part by pushing ranchers into clearing away more of the Amazon rainforest. Left to its own devices, a free market would adjust to the new conditions brought about by our recent irrational obsession with biofuels. Agricultural markets adjust less quickly than some other markets, but they do adjust. Given the chance, farmers invest in greater productive capacity and meet the higher demand, reaping the rewards but also bringing prices back down to a more reasonable level. Unfortunately, the global agricultural market is far from free. In fact, it remains one of the most heavily-protected areas of the global economy, an anomaly that the stalled Doha trade talks are intended to address. Thanks to decades of prior interventions including price supports and market access restrictions in rich countries (not to mention a lack of secure property rights in poorer countries), farmers in much of Africa especially have underinvested in agriculture for many years, and so will be slower to take advantage of, and help alleviate, higher prices. To make matters even worse, governments around the world are reacting to the food crisis in all-too-typical ways, attempting to correct the unintended negative consequences of prior interventions with yet more intervention. Says The Economist, "Of 58 countries whose reactions are tracked by the World Bank, 48 have imposed price controls, consumer subsidies, export restrictions or lower tariffs." Only the last of these, lower tariffs, which represent less intervention, will help ease the situation in the long run. The other three are classic instances of intervention, and will only serve to delay the much-needed adjustment of the market. What would have happened if agricultural markets were really free? Rich countries would not have protected their domestic markets for decades, and farmers in poor countries would have enjoyed secure property rights, both of which would have encouraged those farmers to invest more over the years. This would have allowed them to raise their standard of living, and also would have given them the ability to react far more quickly to the current crisis. There would be no resorting to short-term fixes like price controls, consumer subsidies, or export restrictions, which only prolong the problem. And finally, tariffs would not need to be lowered, because they would not exist. Of course, in a truly free market, there would be no subsidies to ethanol producers, and so the current food crisis would never have become as severe as it has today.